How *I* differentiate between a dark sooty bay and a seal brown: I don't. I'm not entirely convinced there is such a thing. (This will not be a popular theory, I am aware.) 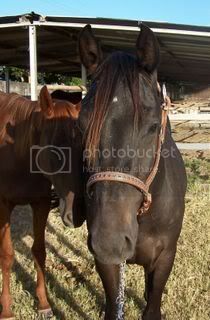 I believe MOST of the horses people think are sooty bays are actually browns. I have *never* seen a bay that looked sooty to me. Seriously? I had one. She was a bright red bay who looked like she had walked under someone dumping, well, soot. This is, of course, totally different from seal/brown because she was obviously not that. I'd love to see the pic. Sadly the seal phenotype is highly subjective and until there is a test we have no idea how similar it could be to normal bay (admittedly I think it would be rare to have one that was not distinguishable from normal bay though, but no proof). I've always like the At theory, and I do think there is probably a distinct inheritance for the "brown" phenotype. I do usually distinquish between sooty bay and brown. I have seen very few "brown" phenotypes in Arabians and Morgans, but very many dark or what they call "black bays." Thoroughbreds, on the other hand, are chock full of them. Come to think of it, I don't recall seeing very many, or any, brown Arabians. Morgans I couldn't tell as half the time I can't tell if they're red based or black. :rofl Thoroughbreds, yup, all over the place. I happen to know Seattle Slew was homozygous black and was theorized to be homozygous agouti. I 100% feel he was an At himself, which in theory would mean he was either Ata or AtAt. Might be interesting to dig into his kids a bit. I may do that when I have time. 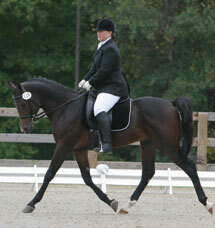 I also know, his son, Vindication (RIP, we lost him too young), was homozygous black. I have no idea of his agouti status, but if he had agouti at all (which could tell us alot about Slew) it was *definitely* At. He was very dark himself (his conformation photo lies about this) and every one of his foals I have ever seen looked pitch black with the occasional exception of a slightly lighter muzzle and maybe flank. It used to be at the sale I could spot a Vindication a mile away by this. Most consistent family I've seen at producing very dark horses outside of the Halo family, which I believe was actually true black despite what they say. Yes, MissMagus says she has seen brown in Arabians. But in all my years, I have only ever seen one I could point to and say "that's brown." I thought the Halo family was black as well. Apparently, registering an arab as a black bay is seriously a PITA as I recall the story of proving it. I missed all this discussion due to no internet connection yesterday. For the record, the photo with the mare & foal was taken in late summer hence the mare is somewhat sun bleached. which is I what I define as seal, to my eye anyway. The sire of the foal is exactly the same colour as her. I don't think the foal is an unusual colour at all, just plain old bay, that was a foal picture, so a foal coat. Will take one in the next few days to show her colour now. I thought that testing so far revealed that all seal horses tested carry agouti??? Doesn't mean that there can't be another gene though I guess. why not agouti???? Just a thought. Actually, come to think of it, my other seal mare, had a very dark bay/possibly seal filly to my normal red bay stallion this season. If normal bay is dominant, shouldn't her foal have been red bay??? LOL, perhaps need to start a new topic. Yes, all seals test bay. Sounds logical to me (expressions being maximum or minimum) - like perhaps the way identical twins come out with different white markings? I think the AHA is one of the more sensible registries when it comes to color, brown not being an option. subjective. I think we are pretty much guessing as to which bay is dominant to what or how they are inherited, still makes for interesting discussion. All seals do carry agouti. But we can only test for the "non agouti" so we can't say which allele they are actually carrying (unless it's the non allele). Actually seal is a minimum expression of agouti (agouti restricts black) when you look at it like that, but that doesn't mean it's not caused by different alleles. The reason the theory of dominance was developed as it is (wild bay, bay, brown, black) is because whoever came up with it felt that the most recessive alleles would be the darkest. Wild bay is the "loudest" and brown is the most minimal. To me personally, that way of thinking has no place in the genetics world. If these alleles all developed/mutated at different times (which they likely did I'd think) the order of dominance could be *anything*. The only thing we know for sure is that black 'aa' is the most recessive. The only thing that would have guaranteed that foal be red bay (if the theory is correct) was if the sire was homozygous red bay. If he passed an 'a' and the dam passed 'At', you've got a seal. If he passed 'A' and mom passed 'At' you've got a red bay carrying seal. Supposedly. Well, I think that may go back to not knowing how red a seal can be and still be genetically a seal or how dark a red bay can be and still be genetically a red. The theory could be wrong, or we may just not have enough information. Most genotypes have a much wider expression range than the average person would account for with a phenotype. How many horses have you seen that tested something that they did not look AT ALL? I've seen a bunch. After looking at the genotypes side by side with the corresponding phenotypes, we start to see visual clues and we learn that ____ may mean the horse is ____ when originally that would have never crossed our minds. Some tests only confirm what we already knew (champagne for instance), and others open a whole new world. So they call everything bay? Based on what I've seen of 'A_' Arabians, I don't guess that's that bad, but it's actually a little irksome to me that they don't have some category to distinguish seals. They don't. I think it's much easier and more sensible, as the term has alway caused confusion. It's impossible to explain adequately, can't be visually agreed upon, argueably may not exist, and is technically imprecise. Even the TBs equate it to dark bay and the Jockey Club couldmake their lives vastly more simple by just saying it's bay. It's not as if they're trying for points in correct color assignment anyway. Even Pet DNA refers to it as a bay variant. Well it is a bay variant I suppose so I guess technically it is still bay. The Jockey Club does it because (before there were crazy colors like the creams) they wanted someone to be able to look at the papers and have an idea what the horse would look like. 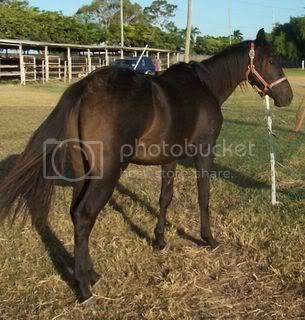 Just saying bay even for horses that look almost jet black is not a good way to do that. They still register horses based solely on phenotype. Double dilutes are registered as palomino, buckskins as bay, smokey blacks as brown. Phenotypically, for the most part, those fit. Of course we all know the problems involved in doing that. That Jockey Club, however, is not going to be one to tell you "Oh that horse can't be from these parents because you can't get a palomino from a brown (technically a smokey black) and a chestnut." They know about that, but they don't care. They go solely on looks. I can't speak for other registries. I've just read this thread and thought you might find these photos of Raven interesting. I owned him until recently. I consider Raven a Seal Bay/Brown from two bay parents. 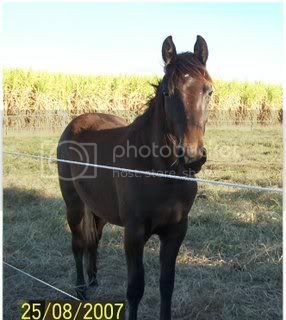 Raven is 3/4's quarterhorse and 1/4 tb. The day Raven arrived. Looking the same shade of bay as his sire except he has the light muzzle and light flank area. He had just turned two years old and had been on a good pasture diet. Raven a year older, on a high protein diet. He went really black except for his flank and muzzle, which though it remained lighter with a gold tone, it still darkened up from the original yellow colour. Since Raven has been sold, he has retained his dark colour, though it could be diet related or because it's his adult coat. Miss Magus had a buckskin filly that was a dead ringer for a cream on brown phenotype. The mare was a standard bay, the sire perlino dun. Are you thinking what Michal thinks is "At" might actually be sooty? That's been pondered before but to our knowledge he isn't testing chestnuts yet. It is. It certainly has validity IMO. I don't personally believe it's true, but I think it's a very logical possibility. I think the one thing that tends to sway from that is that he claims the mutation he found is IN agouti, which would mean even if it were sooty, it would still be a sub set of agouti. Since agouti apparently doesn't work on chestnuts, that leaves it less likely. Why isn't he testing non-seals? Wouldn't it make the gene more credible as an agouti variant to show that it doesn't affect chestnuts and isn't present on blacks? See, that doesn't lend any more credibility to the test for me. If I were testing a possible new gene (and this is coming from a non-researcher/geneticist), I would test a wide variety of horses that I expect not to have the gene to prove that it is, in fact, linked to that specific phenotype. I'm sure that will be part of his research, I think they just do it in stages to make sure they know what they're looking at on the color it shows up on. If he's offering this as a test, then he MUST have already tested horses he would not expect to have the gene to ensure that they did not. That is part of VERY standard quality control in any testing facility. Any lab will run horses with the trait and without even in the very preliminary stages of research. She only had to prove that he wasn't black as that's what they insisted he was if I recall? But I have to say, that it irks me to no end that I checked the grey box and Khaos was registered as a chestnut rather than a grey. Being more accurate I guess is better even if they think they know it all.